Cut fresh and Ohio grown! Our cut Christmas Trees are all Ohio-grown and fresh! While we no longer have our Christmas tree plantation in Indiana or Pennsylvania, our cut trees are about as close as you can get to cutting your own! All of our cut trees are grown on a small family-owned plantation in Southern Ohio that takes great pride in the quality and freshness of the cut trees. 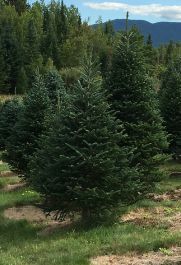 From 5 ft to 11 ft and from Pine to Fir, we have the perfect tree for you! Another important detail of our cut trees is that when they are 3-4 years old, they are limbed up to about 18″ from the ground to make it easier to mow the field to keep down weeds. This also creates a “handle” to insert the tree into the tree stand so that you don’t need to wonder how many lower branches you’ll lose that will affect the beauty of your tree! Want to pick from the best selection but you’re not quite ready to bring home your tree? We will be happy to hold your tree until you’re ready! Let us do the work for you! We offer both delivery and setup service for our Christmas trees for a nominal fee. Its made in the United States! The mostly high density plastic construction means it doesn’t corrode and it is strong as heavy steel. The water holding capacity far exceeds other stands. The “scalloped” design of the base allows most of the significant lower limbs to be kept on the tree. There is a great amount of maneuverability of the tree trunk in the stand which allows the most stubborn crooked trees to be stood up straight. Once mounted, the tree is very secure in the stand and is highly unlikely to fall over as long as the proper size stand is matched with the tree. Cinco stands are not expensive and are an excellent value as it could be the last stand you ever buy! I remember selling a customer an 8 foot Douglas Fir and spotting a plastic stand with a $9.98 price tag from a very well known retailer. I asked him if the stand was for the tree I was loading and he replied that it was. It was easy to see that the stand, molded out of soft plastic, would never “survive” the Douglas Fir and the tree would almost certainly fall over. I’m so glad the customer bought one of our Cinco stands and returned the $9.98 stand to the box store. A short-needled tree that decorates well and is soft to the touch, silvery underneath and lasts 30 days or longer in the house without shedding. Very similar to the Fraser Fir, the Canaan Fir is a short-needled tree that decorates well. A great choice for needle retention, easily lasting 30 days or more in the home without shedding. A medium needled Pine that lasts 3-4 weeks in the house. Our Scotch Pines are grown on level ground and were aided with a wire called “grow straight” when young. The trees have been placed in a shaker to rid tree of dead needles inside. Only Scotch Pine and White Pine are sprayed with a product called Greenzit which gives the trees a dark green color as Pines sometimes have a yellow cast when they go dormant in fall. Because of a nationwide shortage, there will be NO Scotch Pine available in 2018. Fluffy and very soft to the touch. 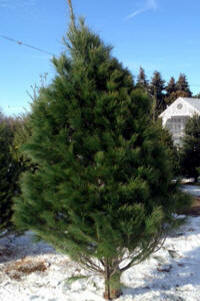 It has needles longer than the Scotch Pine, usually 2-3″ in length. This tree will not hold heavy ornaments because it’s branches are very limber. Will last 3-4 weeks in house. The tree should have a fresh cut across the bottom, about 1 inch above the old base. This removes any clogged wood that may not readily absorb water. The tree should be placed in a stand with a large reservoir of water. Depending upon the size, species and location of the tree, it may absorb a gallon of water in the first day, so it should be checked frequently and re-watered as necessary. It is important that the tree always be kept watered and not allowed to dry out. If the tree does dry out, it may not be able to adequately absorb moisture once it is re-watered, and it will shed its needles prematurely. Taking the tree down and cutting about a 1 inch slice off the bottom of the trunk, then placing the tree in the stand and re-watering will remedy this problem. Although inconvenient, it is the only way to prevent early needle loss. Overall, a good rule of thumb is to treat a green Christmas tree just like a fresh bouquet of cut flowers! The tree should be located in a safe place, preferably near a wall or corner where it is not likely to be knocked over. Keeping the tree away from heat sources such as hot air ducts, wood stoves, fireplaces, etc… will help to preserve freshness and lessen fire danger. Similarly, light cords and connections used in decorating the tree should be in good working condition. Lights should always be turned off at bedtime or when leaving for an extended period of time. All balled and burlapped trees should have a gradual temperature change. Place the tree in an in-between temperature for a day such as an unheated garage. Balled an burlapped trees also need water! One way to achieve this would be to place the tree in a large tub and take a 2 liter bottle and prop it up between the branches with its opening in a slit in the burlap. This will allow the water to trickle into the ball and soak in. Usually, two of these bottles should be enough so that the tree will receive 1-2 gallons of water at each watering.